We woke up at 3:00 without incident, and made our way down to the lobby where Rosa picked us up. We drove to the airport and got everything taken care of. There were quite a few flights leaving before 6:00 am for Iquitos. For some sort of weather-related reason, the Iquitos airport is open only very early in the morning and very late at night. 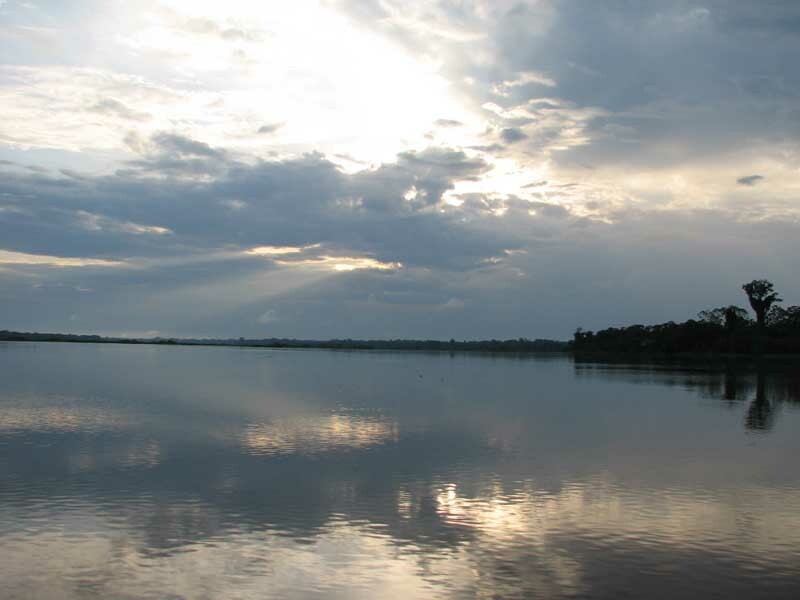 Iquitos, by the way, is quite possibly the largest city in the world that cannot be reached by road. It has a half-million inhabitants, but the only ways to get there are by boat or plane. 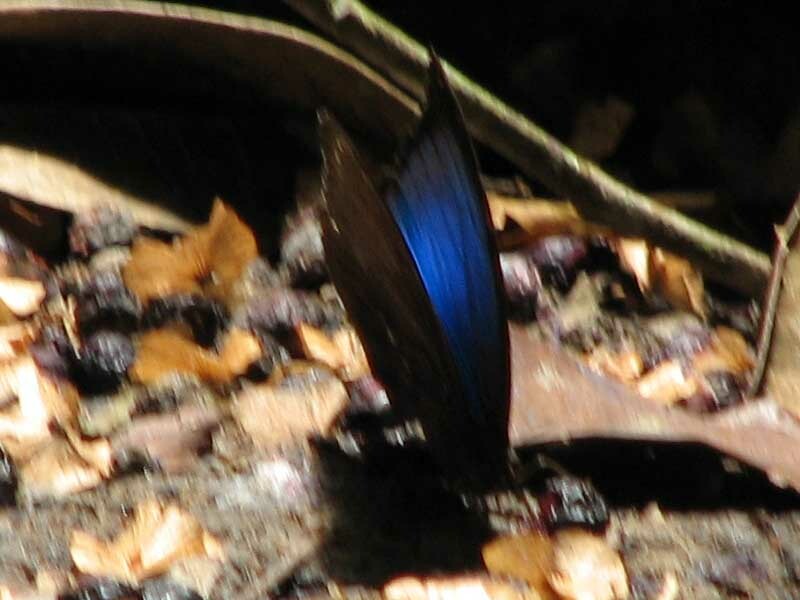 It is in the middle of the rainforest, bordered by the Amazon and its tributaries. It got to be so large because of a rubber boom in the early 1900s and an oil boom more recently. Because of its remoteness and inaccessibility, it was one of the few large cities in Peru that had no problems with terrorism in the 1980s and 1990s. We tried to get to sleep on the plane, and actually succeeded at first. But Crystal woke up when one of the flight attendants asked over the PA if there was a doctor in the house. An older lady a couple of rows ahead of us had fainted. The answer was yes – there were between 4 and 8 missionary doctors who were headed to Iquitos . Most of the rest of the trip several of the people in the group and the flight attendants tried to determine if she needed emergency assistance when we landed, or if she would be fine. They determined that she would probably be fine without any extra attention. When we landed, we were greeted by our guide, Willy, from the Ceiba Tops Lodge. Willy told us that it was not the weather that prevented mid-day flights, but rather that vultures feed in the middle of the day near the airport and the airline does not want to risk one of them getting stuck in the engine. 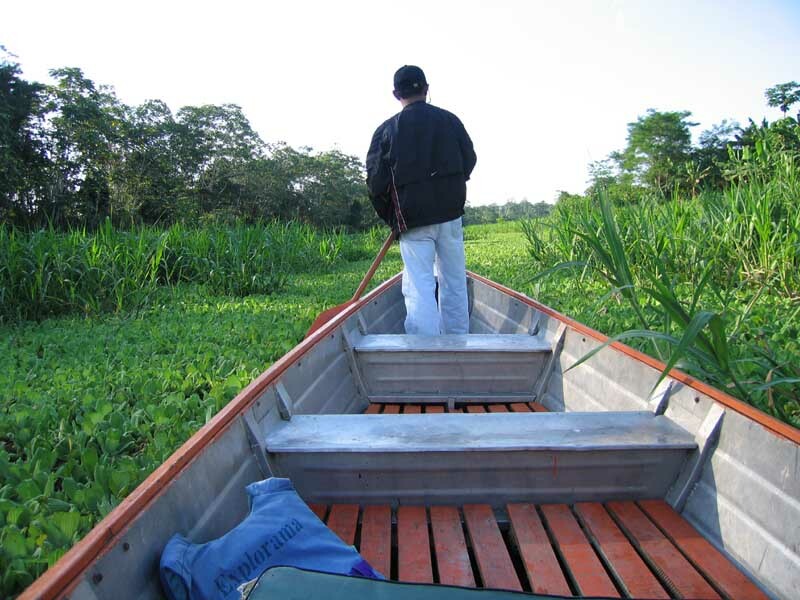 We took a short car trip from the airport over to the Itaya river, a tributary of the Amazon. 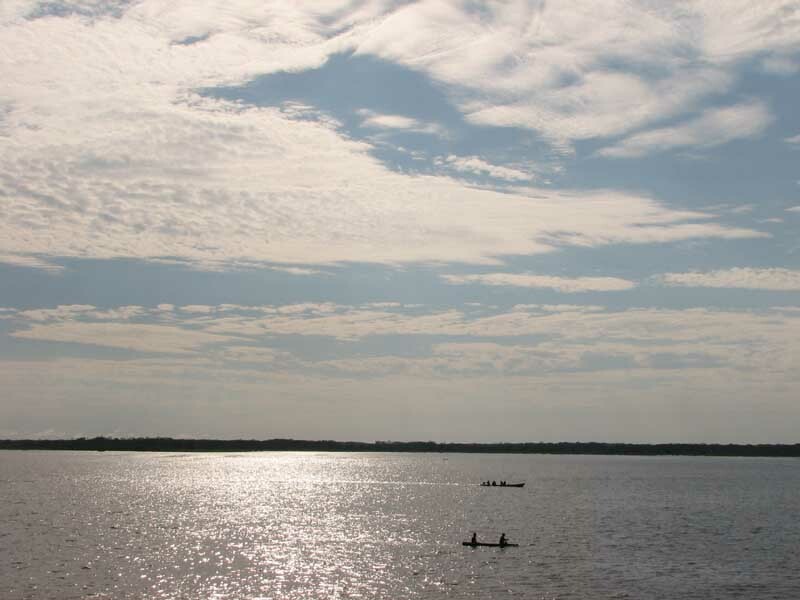 The Amazon forms in Peru at the junction of the Ucayali and Marañon rivers, a little south of Iquitos. It runs north and then east through Peru, and then mostly east through Brazil before entering the Atlantic Ocean with a 40-mile wide mouth. The boat that we got on was very large, and went very slowly. 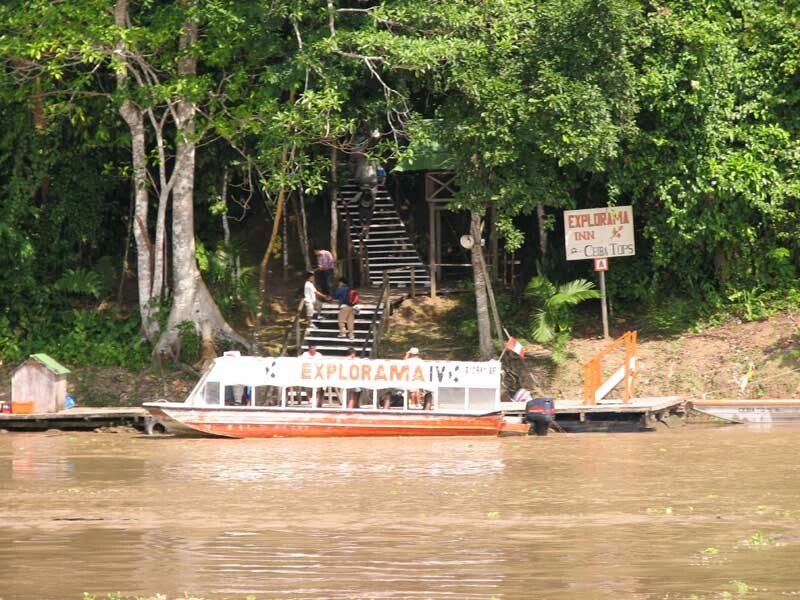 The Ceiba Tops Lodge is about 25 miles north (down river) from Iquitos. Justin kept fiddling around with the video camera in an attempt to take some video, but the video camera would not let him load a tape because it detected condensation. Somehow the 95% humidity caused some condensation to form. 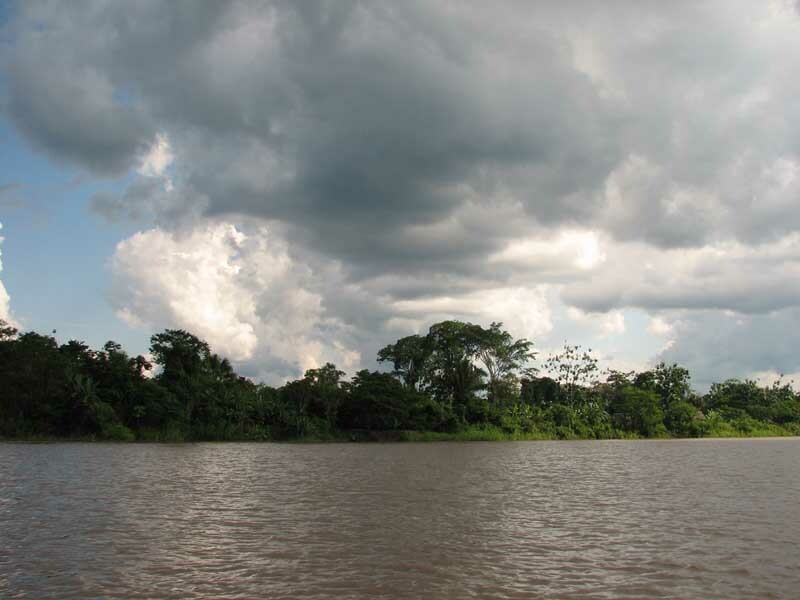 After about 5 minutes we joined the Amazon – it was very noticeable because it is much more brown that the feeder rivers around Iquitos. 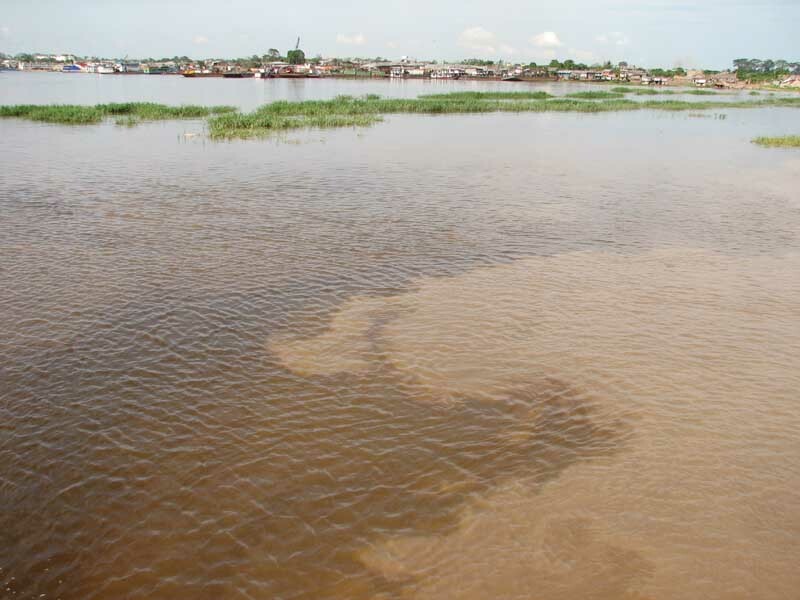 Most of the feeder rivers are dark, almost black, from all of the decomposing plant material that is deposited every year when the river rises. Between low season and high season, the water level can change by 45 feet. 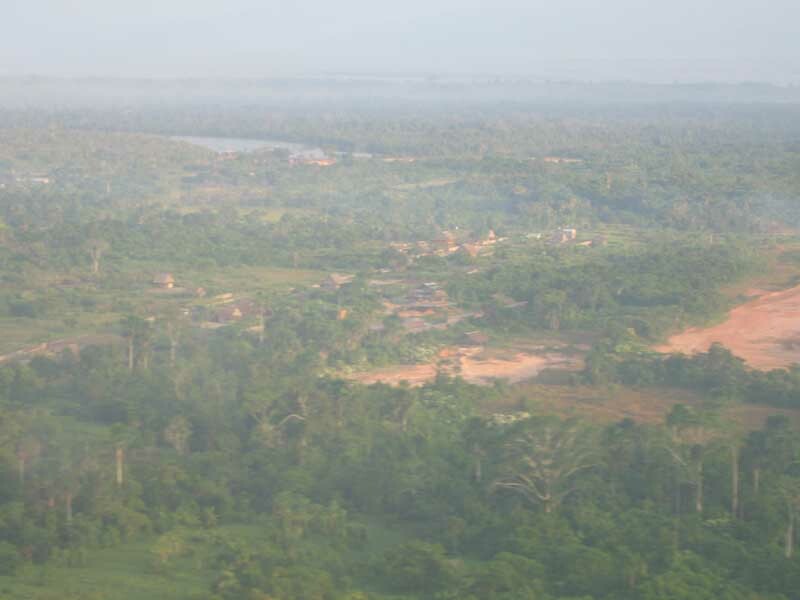 The Amazon itself has this material as well, but also had a lot of mud from the snow runoff on the Eastern slope of the Andes where it starts. 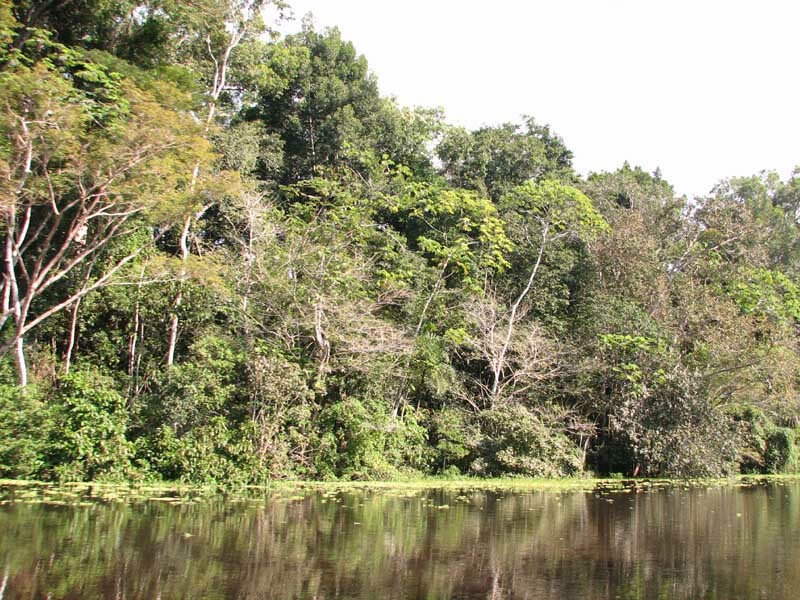 The Amazon itself was huge – much larger than we had envisioned. It was anywhere between 1.5 and 4 miles across, meaning that we were in full sun the whole time. We had envisioned a narrower river with trees arching out over the river and shading most of the river. When we arrived at Ceiba Tops, Willy quickly ran through what was where, when meals were served, etc., and then told us we'd be leaving on a rainforest walk in 15 minutes. So we scurried to our room, bathed in insect repellant, and walked back to the "lobby." The walk was very interesting – Willy kept stopping every 10-20 feet to show us something new – army ants, walking sticks, poisonous mushrooms, poisonous toads, birds high up in the trees, plants that had medicinal value, other trees and plants – everything under the sun. The bad part was that every time he stopped, we were engulfed by mosquitoes. They were everywhere. Justin had long pants and a jacket on, so only his head and his hands were exposed. He got about 10 bites between his two hands. Back at the lodge, Justin took a short nap before lunch. Somehow Crystal stayed awake, and somehow she managed to get Justin up for lunch. He was comatose all through lunch, between his illness, the malaria pills, the insect repellant, and the severe lack of sleep. We finished eating and went back to the room, and were asleep within minutes. Again, Crystal somehow managed to keep us from missing something, as she woke up shortly before our planned 2pm excursion. The excursion was just us, Willy, and a boat driver, on what was basically a rowboat with a motor attached. We were a little skittish at first, but when we didn't tip in the first five minutes we were more at ease. 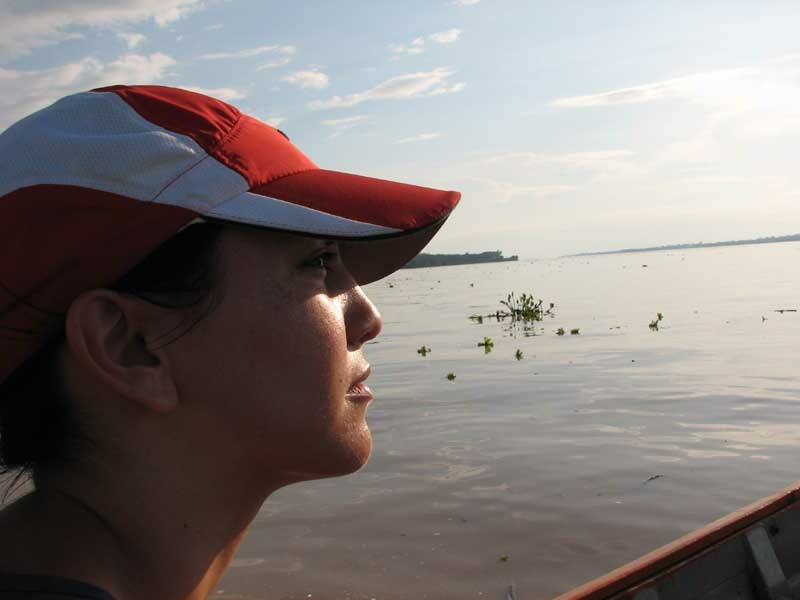 Our first stop was on one of the tributaries of the Amazon. 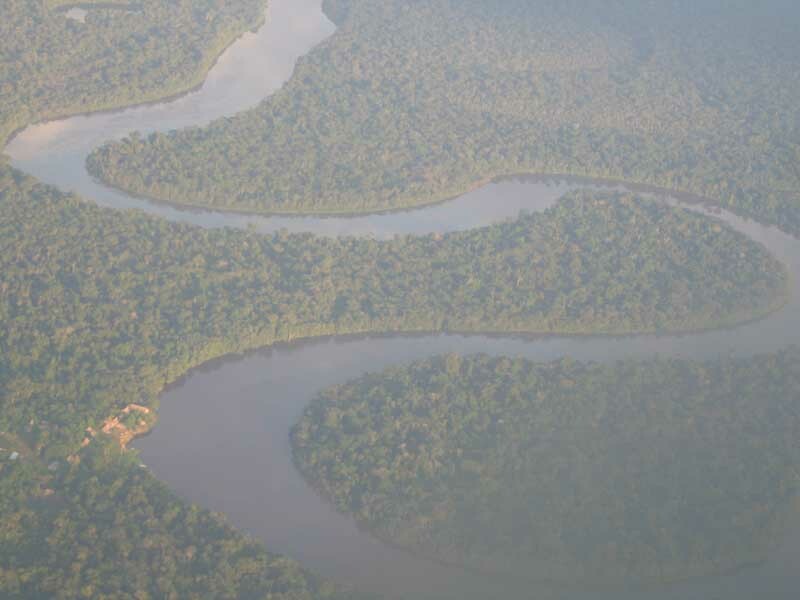 The best way to think about the Amazon and the connected rivers is to imagine roads in a large city – a large freeway, with some large cross-streets every so often, which have smaller streets that come off of them. This "cross-street" that we were on was larger than any other river we had been on. We stopped at a Yaguas village. 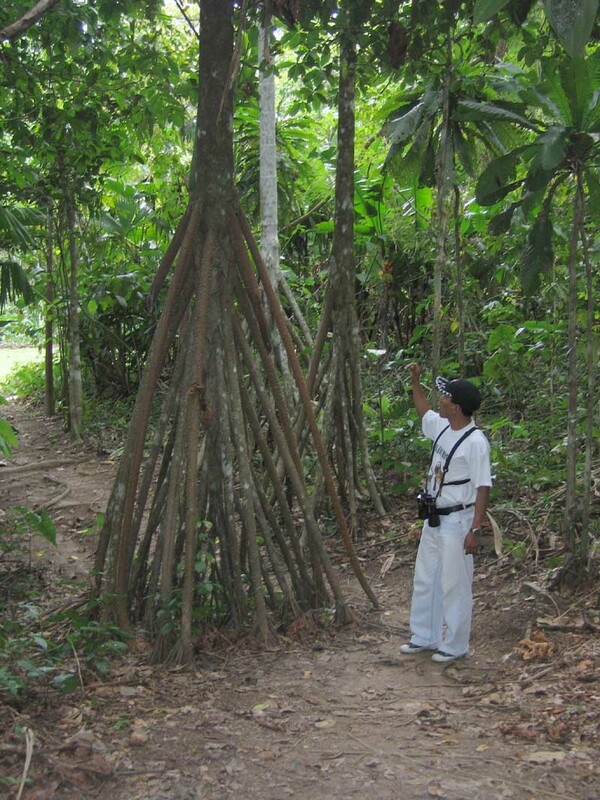 The Yaguas are one of the indigenous tribes that remain in the area. Willy explained to us how their way of life worked, where they came from, and how they remained indigenous in current times. Best as we could figure out, they have remained indigenous by working out an arrangement with Ceiba Tops wherein the Lodge guests can come see them do their "indigenous stuff" in return for goods or money. The problem with this, however, is that it is transparent to the tourist – or at least it was to us. They were disinterested – which frankly, they should be – and it showed. Seeing how they made blowdarts, and actually blowing blowdarts, was pretty cool, but the whole experience had a "come see the bearded lady" feel to it. At the end, the people tried to sell us a bunch of trinkets – not good times. The excursion got much better thereafter, though. First, while heading up the river, we saw one of the river dolphins – not a pink river dolphin, just a gray one. It was very interesting to see dolphins in the middle of the rainforest, however. We kept putting around in the boat, and Willy kept pointing out more trees, birds, and other interesting facts about the area. 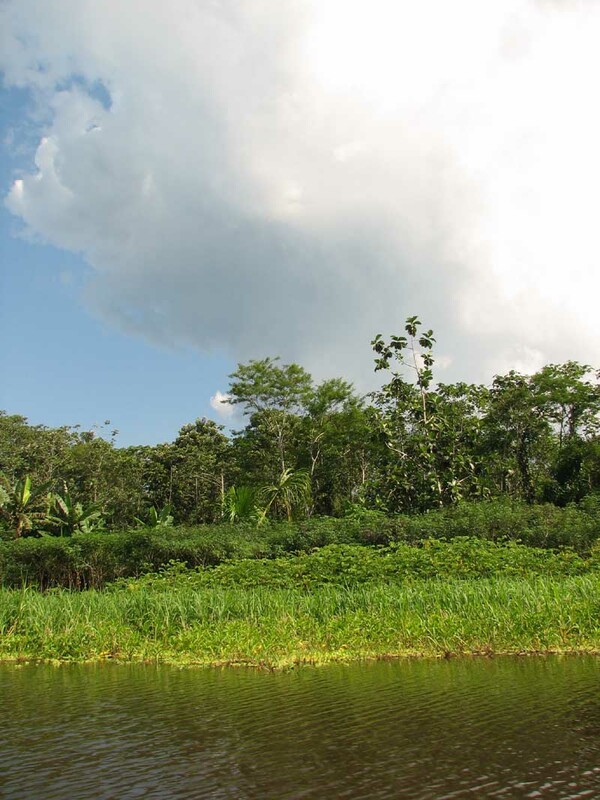 We realized being in a moving boat on the river is one of the most comfortable settings in the rainforest. There are no bugs and the breeze keeps you cool. 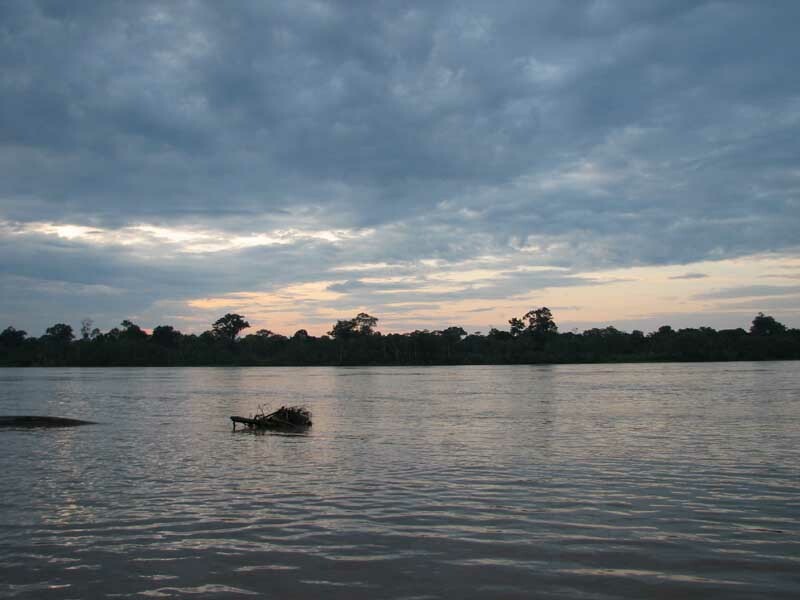 We stopped at one small area on the side of the river to fish for piranhas. During the low season the chance of catching them are close to 100%, but during the high season they go into the surrounding swamps where there is less current and more chance for food. We don't fish, but we gave it a whirl. For about 10 minutes we had no luck – we felt some tugs, but every time we pulled the line up we had nothing but an empty hook. The fish were far smarter than we were. 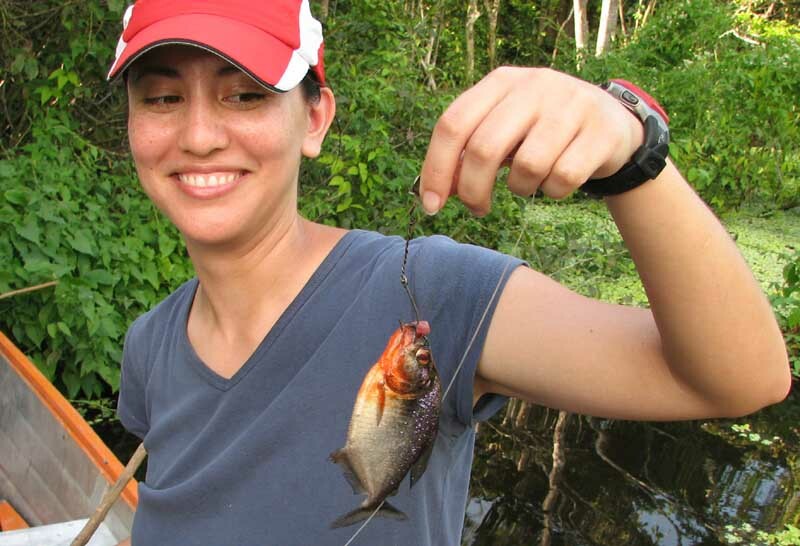 Then, just about as we were going to give up, Crystal nabbed an orange piranha, one of the more aggressive varieties. There are over a dozen different species, with varying sizes and temperaments. The piranha was much smaller than we expected, but they probably don't need to be very large when they hunt hundreds at a time. Willy took the fish off the hook and showed us its teeth – they were a sight to behold. Then he took the fish over to a nearby plant and put its mouth near a branch – it cut right through it like scissors. Crystal was happy to know that she had not killed the fish – Willy put it back in the river. The last stop on the way back to the Lodge was to stop at an Oxbow lake and check out the Victoria amazonica – giant lilly pads. There were only three plants, but they covered an area maybe 300-400 square feet. The bottoms of the lilly pads are spiked to keep fish from eating on them. The flowers turn into new leaves after expiration. 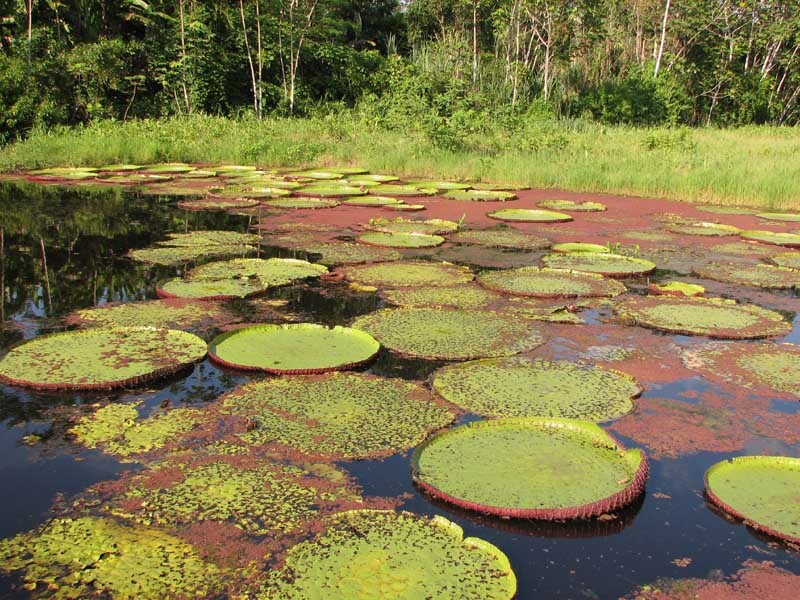 We had seen the giant lilly pads before, but never in their native habitat. We got back to the Lodge around 4:30. Dinner was not until 7:30, so we decided to enjoy the luxury of the resort. 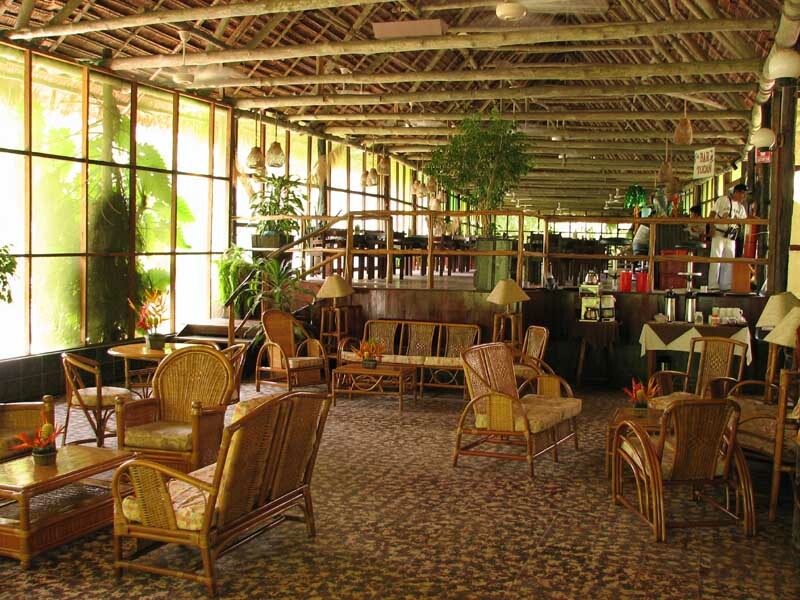 Although out in the middle of the jungle, Ceiba Tops has a pool, a Jacuzzi, and air-conditioned rooms. Earlier in the day, we saw a bunch of people in the pool, and wondered aloud "they're in the middle of the jungle, and they're sitting in a pool?" Well, this is why. It's very hot, very humid, and there's only so much jungle one can stand on a given day. The pool was very relaxing, and was a welcome change from bug spray. There were two couples in the Jacuzzi discussing travel locations, and they struck up a conversation with us. We've found that these are the people to speak to about prospective locations for future trips. One couple had gone to South Africa, Botswana and Zimbabwe two years ago, a trip we'll be making next year (although going to Zambia instead of Zimbabwe). They really enjoyed it, and told us what to do and what not to do. Crystal noted that the people we meet on vacation seem to be nicer; Justin noted that's probably because they're on vacation. We went back to the room, got ready for dinner, ate, came back, and went to sleep in record time.